Would chefs buy local, sustainable fish if the price was competitive? Would consumers want this? The answer is YES to both. 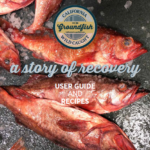 Over a 90-day period, we conducted a pilot project with an institutional food service buyer in California to raise commercial buyers’ and suppliers’ awareness of U.S. West Coast Groundfish as a domestic, sustainable source of whitefish and prove that these fisheries can provide a reliable supply of local fish. The results were fantastic! 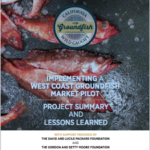 This pilot has helped establish new markets and demonstrate the value of West Coast Groundfish. We now have two guides available to learn more about the project and the lessons learned. The user guide, created for Compass, outlines how we conducted the pilot program. Download it by clicking here or on the thumbnail image. Please share, use, and adapt to fit your needs. The pilot provided timely real-world inputs and lessons learned for all the participants. As with many pilots in the business world, this one validated a number of previously identified opportunities and provided insight to new opportunities; it also confirmed a number of identified risks and exposed new challenges to the successful reintroduction of the product to the supply chain in California. Download it by clicking here or on the thumbnail image.